Do you feel behind, frustrated and stressed every morning? Do you find yourself running like a crazy woman trying to find clothes, shoes and socks for your kids before the school bus arrives? Waking up one step ahead is what this post is all about! Disclosure: Some of the links in this post are affiliate links. This doesn’t cost you anything extra but may result in me receiving a small commission when you purchase through these links – for which I’m very grateful! 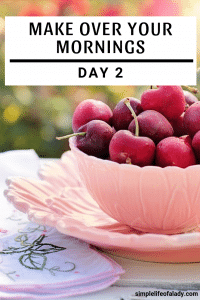 Hi and welcome to the 2nd day of the challenge I’m taking – making over my mornings! This is with the help of Crystal Paine’s course, Make Over Your Mornings. For those of you who just came today, here’s the link to Day1 of the challenge. There is a very simple strategy to getting ahead every morning. To start your day right, prepare for it the night before. You read that right. The secret is preparation. What are the tasks that you can do tonight, so that you don’t have to do them in the morning and things will go smoothly tomorrow? Preparation time at night may be short. But it sure does eliminate a lot of decision-making in the morning. This is not about creating a long list of to-dos. Crystal makes it very clear in her course. 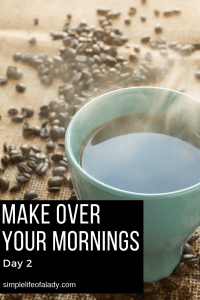 Rather, it’s about focusing on the tasks that will make a huge impact on how your mornings will flow, bringing peace and calmness to the rest of your day. Now in my case, it’s getting the kitchen cleaned that has the most impact in my mornings. My husband and I run a food business at home, so just getting the dishes washed and leaving the counters clean are revolutionary in our everyday lives. I’m so taking this challenge seriously, so I created an evening routine checklist out of my top evening priorities, and put it in my bullet journal. Today, I’m very happy and proud to share it with you. You’ll see here that I have three priorities at night, each having their own tasks. It looks like a very long list, but it’s really not that complicated. I just want every detail written so that I won’t forget anything. But these are just three major tasks – (1) clean the kitchen, (2) prepare the food and water for the animals, and (3) arrange the clothes. I’ve been using it for two days now, and so far, my mornings are running as smoothly as I want! Another important part of preparation is making sure you get the rest that you need – and by that, I mean sleep. I often sleep for seven hours every night. Sometimes it’s only six hours but I’m still good with that. If you can get seven to eight hours of sleep every night without being interrupted, that’s great! But if you can’t, like when you have an infant who wakes you up in the middle of the night, that’s okay. You just have to be a little bit more creative. Here are some things you can do if your situation doesn’t allow for a seven to eight hours of uninterrupted sleep. Take naps throughout the day. Take extra sleep during the weekends. Eliminate all electronics in your bedtime routine. 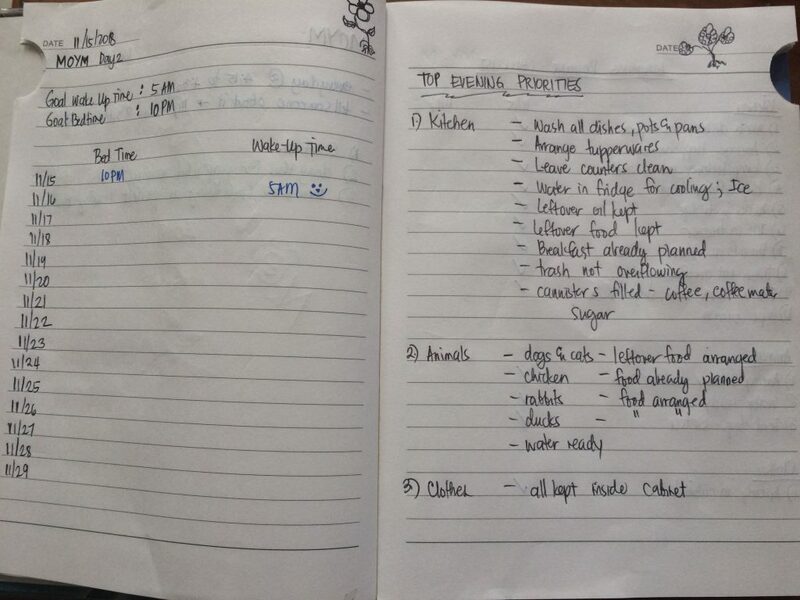 Choose just one or two tasks you can do at night that will simplify your mornings. Move your bedtime back in 15-minute increments until you can consistently wake up feeling rested. Again I’m taking this challenge very seriously, so I also included my wake up time and bedtime goals in my bullet journal. 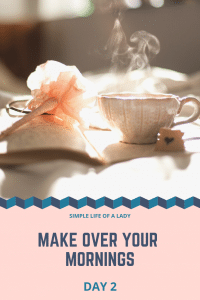 Make Over Your Mornings has a workbook which you can just print and use. So putting everything in your bullet journal is not really necessary. It’s just that, I prefer to use my BuJo than the printable because I can easily customize it to suit my needs. Like my wake up time and bed time goals, I want to monitor them and see whether I am achieving my goals or not, whether I am getting the right amount of sleep. 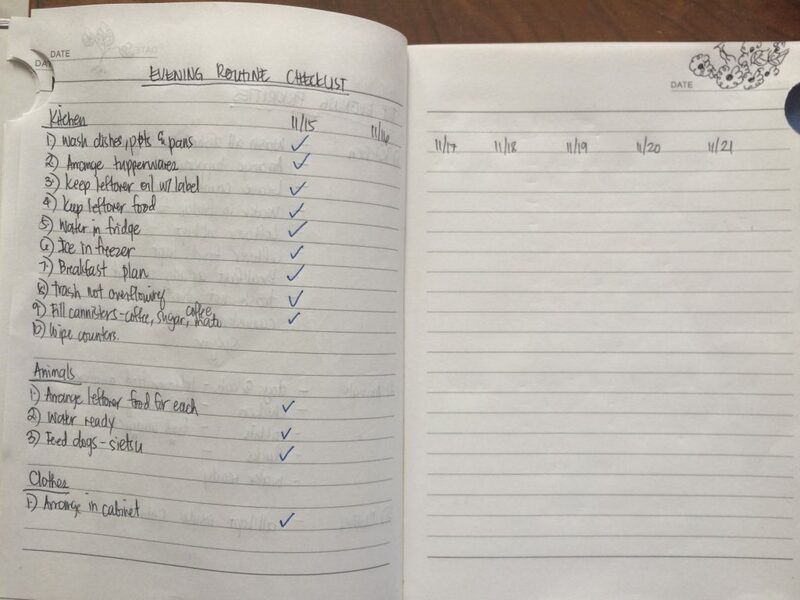 Using a bullet journal, it is very easy to add the space needed to accommodate these details. I will post my updates on these when I’m done with the 14-day challenge. Meanwhile, you can PIN this post so it is easier for you to go back to it. Also, I’d love to inspire other people to transform their mornings too and I hope that by reading my posts, they’ll be encouraged to do so. So PIN it and share the love!